Japan, also known as Nippon or Nihon, is an island nation in East Asia. Situated in the Pacific Ocean and made up of over 6,800 separate islands, the main cities and locations in Japan are located on the four biggest islands: Honshu, Kyushu, Shikoku, and Hokkaido. In total, Japan covers an area of 145,936.53 square miles (377,973.89 square km) and has an estimated population of 127 million, making it the tenth most populated country on the planet. Well-known for its mixture of modern technology and historic traditions, Japan attracts millions of visitors each year. Japan is divided up into 47 separate prefectures across eight unique regions. This country is also one of the most educated and skilled nations in the world, leading the way in technological innovation and certain aspects of popular culture. Japanese people have the highest life expectancy in the world and the country is famous for its unique cuisine and culture. The biggest city in Japan is Tokyo, which is also the capital of the nation and is the most populous metropolitan area anywhere in the world. Here are some more details on the largest cities in Japan. Officially known as the Tokyo Metropolis, Tokyo is the capital city of Japan and the country's biggest city. It's the most populous metropolitan area on the planet, covering an enormous space of 5,240 square miles (13,527 square km) in total and being located on the southern coast of Honshu, the biggest island of Japan. 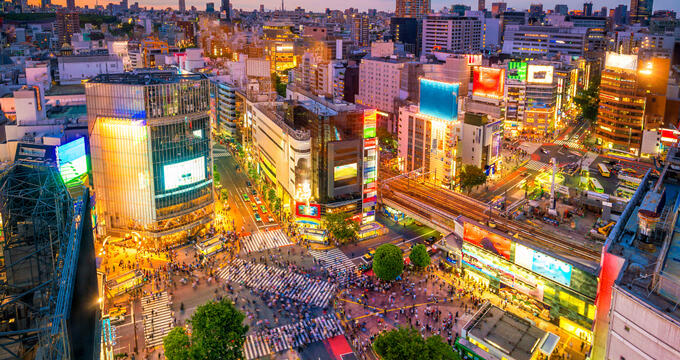 The estimated population of Tokyo is over 39 million and the city has a stronger economy than any other city on Earth. If it was a country all on its own, Tokyo would be the eighth richest country on the planet. Dozens of Fortune 500 companies are located in Tokyo and the city leads the way in many major sectors, including innovation and technology. The city is known for being expensive to live in but attracts millions of tourists and many new residents from around the world each nature due to its enormous size, myriad of attractions, and unique culture. Located in the Kanagawa Prefecture, south of Tokyo, Yokohama is the second biggest region. It is situated in the Kanto region of Honshu Island. Yokohama covers an area of 168.87 square miles (437.38 square km) and has an estimated population of 3.9 million. Due to its coastal location, Yokohama is one of the major port cities of Japan and also has close links with Tokyo due to the proximity between the two cities. The word Yokohama translates to 'horizontal beach' in English. This city is known for its strong transport links around Honshu and the rest of Japan, as well as being home to some iconic landmarks like the Nippon Maru and Yokohama Marine Tower. Located in the Kansai region, Osaka is Japan's third largest city. Osaka is the capital city of the Osaka Prefecture and is located on the Yodo River at Osaka Bay. This city covers an area of 86.1 square miles (223 square km) and has an estimated population of 2.6 million, with over 19.3 million in the surrounding metropolitan area, which is the second biggest metro area in Japan. Osaka has a lot of history behind it and is a big touristic and economic center for Japan, attracting millions of tourists each year with its mixture of traditional temples and modern high-rise buildings, as well as countless eateries and stores. Located in the Chubu region of Japan on the Pacific coast of Honshu, Nagoya is the fourth largest city in Japan. It is the capital city of the Aichi Prefecture and is a major port city for the country. Nagoya covers an area of 126.04 square miles (326.43 square km) and has an estimated population of 2.2 million, with 9.1 million in the surrounding area. The naming of this city comes from a word meaning 'peaceful'. Like many other major Japanese cities, Nagoya is a sprawling metropolis with an almost endless array of modern and older buildings in every direction. The only one of Japan's top five biggest cities not to be located on Honshu, Sapporo is the country's fifth largest city. It is situated on western shore of Hokkaido and is the capital city of Hokkaido Prefecture. The city of Sapporo covers an area of 432.87 square miles (1,121.12 square km) and has an estimated population of 1.9 million. This city is known as one of the major cultural, commercial, and educational hubs of Hokkaido and is well-known for many unique landmarks and attractions like the Sapporo Clock Tower and Sapporo Snow Festival.